Solar Powered Fountain, Glazed Ceramic Koi Decorative Outdoor Best Fountain Pump | Fountain City Art Ctr. Solar Powered Fountain, Glazed Ceramic Koi Decorative Outdoor Best Fountain Pump by By-Smart Solar at Fountain City Art Ctr.. MPN: 80-3B16-E751. Hurry! Limited time offer. Offer valid only while supplies last. This fountain is powered by a separate solar panel(included) and operates in direct sunlight. 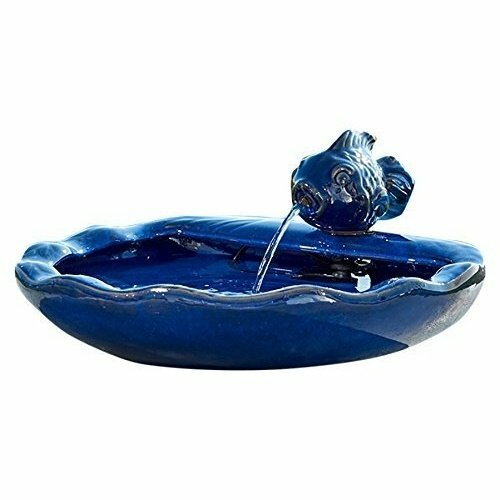 Blue glazed fountain recycles the same water from the bowl. 10 ft cable from pump to solar panel. No wiring, simply install and enjoy. water capacity: 1.5 gallons. Low voltage water pump and filter. If you have any questions about this product by By-Smart Solar, contact us by completing and submitting the form below. If you are looking for a specif part number, please include it with your message.